Every book needs a beginning and and ending, yes? I just finished making the first and last pages of the book in Photoshop this morning- the introduction page, and the colophon. This is the introduction of the project above. 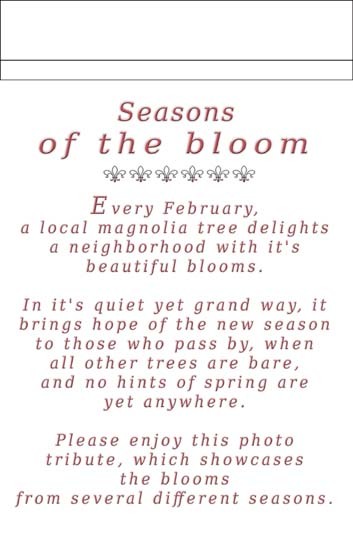 The very pretty flowery bullet is from a vintage border offered by Karen, from her incredible blog called, The Graphics Fairy. Karen is a collector of all things vintage (and thus, old enough to be in public domain) and she offers all kinds of graphics (for free!) for crafting and design projects. I too, love vintage things, and am honored to have a little bit of history in this book. Thank you, Karen! 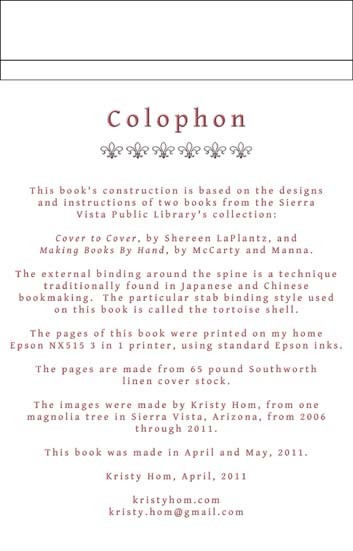 This the colophon page at the end, where I explain how the book was made, list the materials I used, and tell a little about the photographs. Now comes the daunting part of the project...making the book! Now it's time to take out the papers and board and adhesives and cutters. I can't wait, yet hope my hands are as up to this as my heart is. As Ms. Frizzle from the Magic School Bus says, "It's time to take chances, make mistakes, and get messy!" And, as Jean-Luc Picard, captain of the Enterprise D says, "Make it so!" Any blog post that quotes both Ms. Frizzle and Jean-Luc Picard is okay in my book. And I can't wait to see YOUR book. This is such an exciting project, Kristy -- I love the way that you blend the hand made with the high tech and bring it all back to nature. Wonderful, friend! Here's to steady hands! Thank you Kathy! (and I had guessed that it was you, btw) (-: Thank you for your warm-hearted encouragement and confidence as I dig all ten of my thumbs into the book construction!!! It means a lot!! !